Alex Kühni from Switzerland just sent us this one. 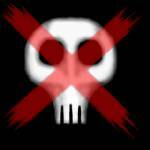 Harald Wörner did some variations of the "No Piracy" logo. They now contain the company title. Some days ago I also got a new logo from Simon Neumann (Amiga Revolution). I would be glad if those logos would be spread with a link to http://www.amiga-planet.de/nopiracy/. Harald Wörner is on the way to design a banner too. Ideas are welcome. This is the well known one that I got some hours after this campaign started. It was done by Harald Wörner and a lot of people including me liked it that much, that we decided to make it the main campaign logo. These designs are from Marko Seppänen from Finland. 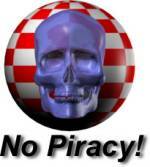 Slogan means how classic Amiga-platform will soon be only playground for those pirates. This outline is from Joakim Svärd from Sweden. This logo comes from Jens Kirsch from Germany. These icons are from Oliver Tacke from Germany. Icon 3 and 4 are animated. These are some more designs from Harald Wörner (1-3). No 4 will be the final logo.